The Bobber is back in black with a moody look and fat front tyre. It’s funny how fashions change and new trends quickly become the established norms. Take the bobber look for example. Nowadays, bobber styling revolves around a set of fat balloon tyres, however back in 1940s post-war America the first bobbers were very different. During this era, riders ripped any excess weight off bikes to create stripped-back machines (‘bobber’ is derived from the term bob-tailed, alluding to their cut down rear mudguards). 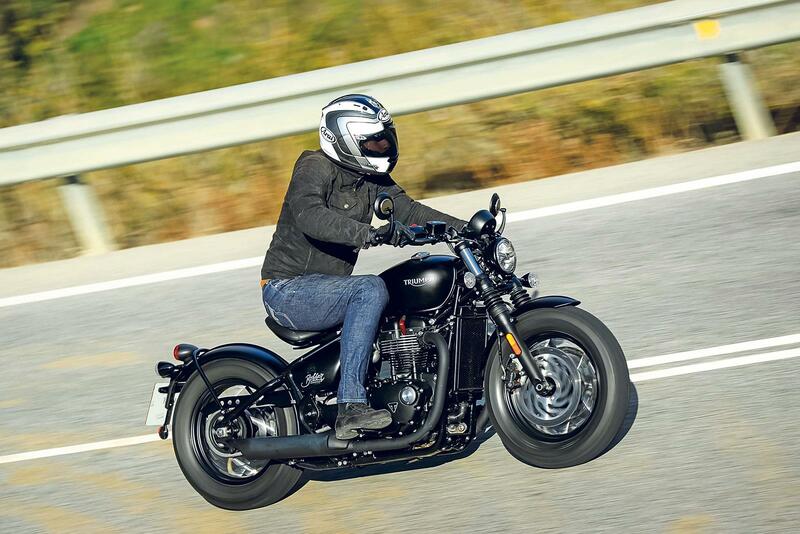 This is why with their first Bobber, launched late 2016, Triumph gave it the same front end as the Bonneville T120, keeping true to tradition. But with the Bobber Black, Triumph have gone for the modern bobber look. Triumph have swapped the Bobber’s T120-derived 19in front wheel for a 16-incher with a fat Avon Cobra tyre. Holding this wheel is a set of beefy new Showa forks and completing the front end’s transformation is an extra disc and caliper (now Brembo instead of Nissin), which the original Bobber sorely needed. As the name suggests, the Black is painted in two options of Henry Ford’s favourite colour and devoid of the first Bobber’s chrome. 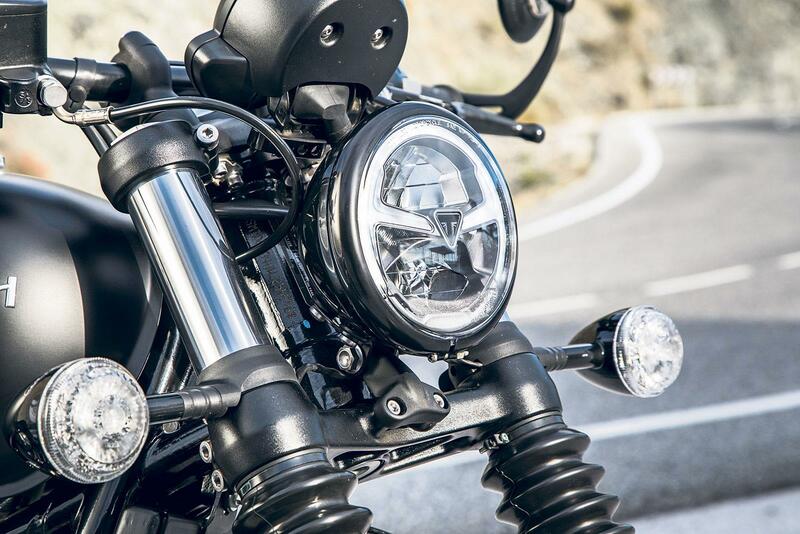 Any shiny parts are now covered in a moody black paint and as a nod to the bike’s modern ethos, the headlight is an LED unit with Daytime Running Lights (DRL). Other than the addition of one-button cruise control and its associated single switchgear, the Black and Bobber are identical. Interestingly both models have the same rake, trail and wheelbase, which is promising as the Bobber surprised MCN with its adept handling. But what does the addition of that chunky front tyre do to this trait? Visually, you have to say the chunky front-end works. In the flesh the Black looks low and moody, like a two-wheeled hot rod and once moving it’s a total revelation. I’ve ridden a few 16in front wheel bobbers and they usually take some getting used to. The wide tyre needs forcing into bends as you overcome its profile and this makes the bike feel lethargic in corners. But there’s none of that here, the Bobber Black responds just like a normal bike and is actually even better handling than the standard Bobber. It really is remarkable and if you didn’t know you would never guess from its ride it had a fat front tyre. Here on the fantastic Ronda road in southern Spain the Triumph is an absolute joy. It rolls into second and third gear corners with complete neutrality, total stability and tracks through the bends with precision. Being a bobber ground clearance is always a limiting factor, but you don’t have to be scraping the Black everywhere to gain a thrill. The whole riding experience is so pleasurable that you are more than happy to ride at the brisk pace the clearance allows for, rather than push too hard and scuff the pegs. 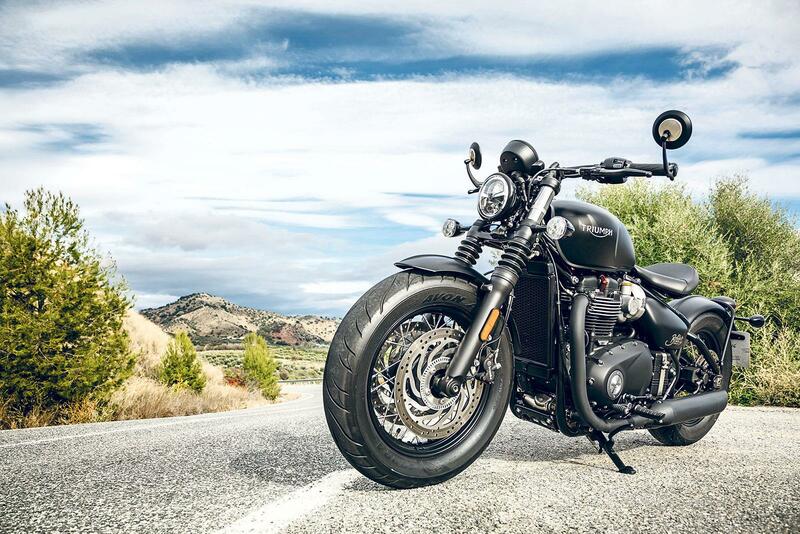 Powered by the same Bonneville 1200 High Torque parallel twin as the Bobber, the Black retains the same spirit and character as its sibling. In the Bonneville T120 the parallel twin is a bit too refined and sanitised, but with the Bobber’s unique tune (which is 10% more powerful lower in the rev range compared to the Bonnie) and slash cut exhaust system, it gives it a lovely feeling and sound all of its own. The bobber look involves being low to the ground and due to this the non-adjustable forks and shock deliver quite a firm ride and over sharp bumps they can feel a bit harsh and unforgiving. It’s a trade-off for the new Triumph’s stunning look and only really makes itself felt on particularly aggressive undulations, but for general road riding the suspension is excellent and remarkably plush. And those twin discs bring a much-needed extra dose of power to the bike. 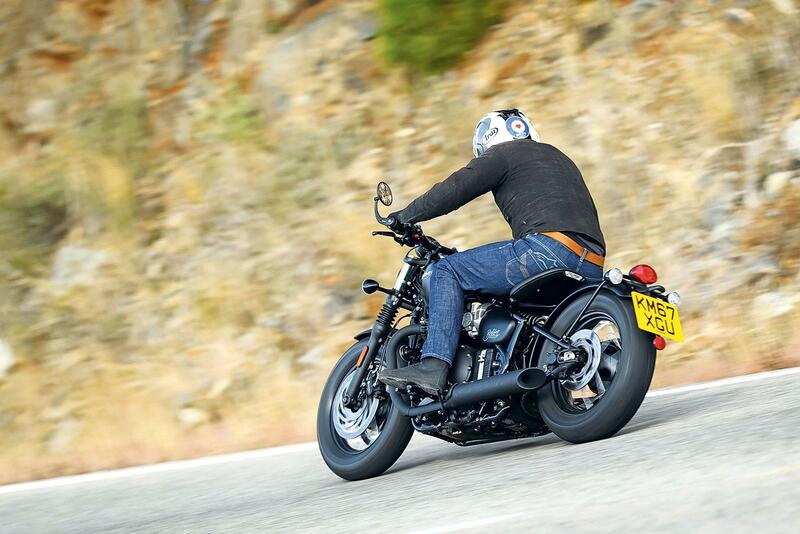 Amazingly enough, this year the Bobber became Triumph’s fastest selling bike of all time – no small achievement considering the company has a history stretching back 115. 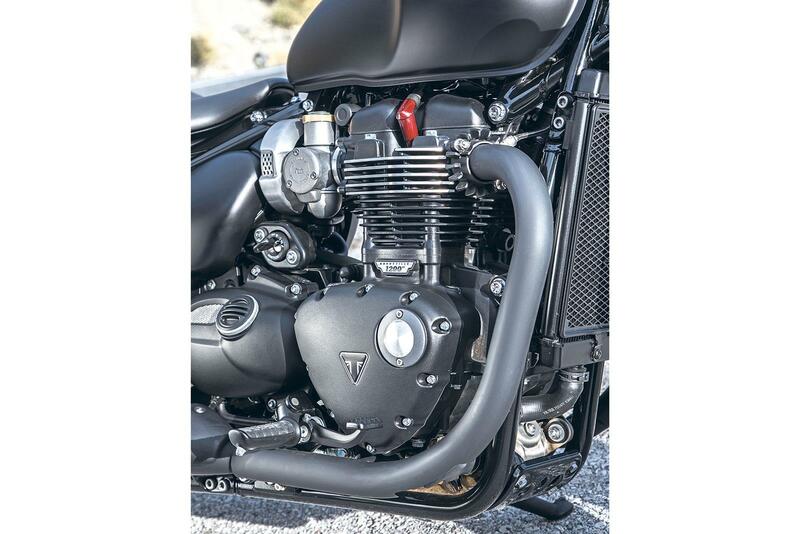 In fact, Triumph had to more than double their production to satisfy worldwide demand. We reckon they should start paying their employees overtime right now because the Bobber Black is even better. This is a bike that not only looks fabulous, but also delivers in spades. It rides wonderfully, sounds and feels authentic and delivers a fantastic riding experience on every single level. It could actually convert those who have laughed at bobbers in the past into real fans of this style of machine – it really is that good. The Bobber runs the same 19in front wheel with a 100/90 tyre as the Bonneville while the Bobber Black has a 16in wheel with a fat 130/90 Avon Cobra tyre. As well as an extra 310mm disc on the front, the Black also adds Brembo calipers instead of the Bobber’s Nissin units and has 47mm Showa rather than 41mm KYB forks. 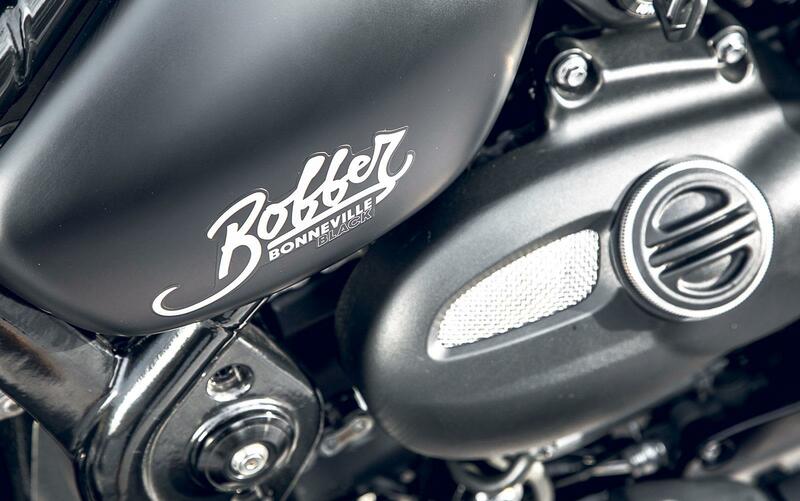 To retain its moody look, all the Bobber’s chrome is black on the Black. In addition, the Black gains cruise control and an LED headlight with daytime running lights (DRLs). The Bobber is £10,600 while the Black is £11,650 and is available in black or matt black for an extra £125. Suspension: 47mm Showa conventional forks, non-adjustable. Rear: KYB monoshock, non-adjustable. If you want to know more about the original Triumph Bobber then why not check out the MCN Fleet page, where Web Producer, Liam has been running one throughout the year.